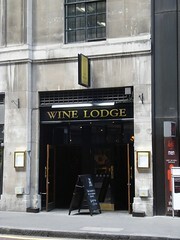 Pub on Fenchurch Street. It used to be a Young's pub, but that incarnation closed in early 2007. It reopened at the end of 2007 as an independent. The ground floor part is a sort of bar-style pub; the only seating available is bar stools (padded and reasonably comfortable ones though). There's a reasonable amount of standing room too, though the place as a whole is not large. Decor is burgundy and bare wood. Not much natural light, though there is a skylight. Two flatscreens at either end of the room. There's a restaurant downstairs (see photo of the restaurant menu as of June 2008). Kake visited on a Monday afternoon in June 2008, just after lunchtime. The flatscreens were showing soundless sport. Background music (generic pop/rock) was loud enough to mask the conversation of the group next to me. Harveys Sussex Best was £1.55/half; other beers were Spitfire, Young's (I think Ordinary), and something else I forget. A bar menu was advertised on a blackboard, including chips (£2.50), chorizo (£4.50), Welsh rarebit (£4), and pitta with hummous (£3.50). Another blackboard advertised Pimms at £10 for a pitcher and £3 for a glass. Last visited by Kake, 23 June 2008. Last edited 2009-09-10 23:27:34 (version 10; diff). List all versions. Page last edited 2009-09-10 23:27:34 (version 10).